Ninth Grade Troy Riverfront P-TECH students are getting medieval this week. 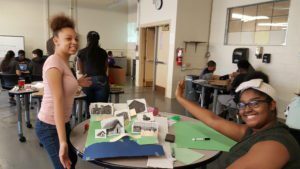 Upon returning from the holiday break, students in the combined ELA/Social Studies class had four days to research a feudal society and create a visual representation of the manor system. Projects ranged in appearance and type including: drawings, paintings, Legos and 3D models. Two groups even used the video game software, Minecraft, to create a playable version of the land. In case you forgot, the manor system is the way in which feudal lords organized their lands in order to produce agricultural goods. The manor includes the house and accompanying village, farmland, meadowland and wasteland.